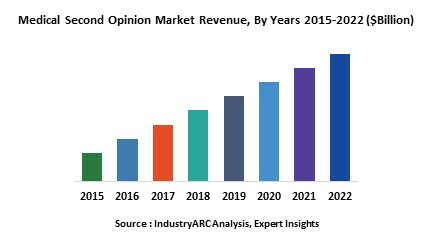 The Global Medical second opinion market recorded revenue of $2249million in 2017 and is estimated to grow at a CAGR of 18.2% throughout the forecast period 2018-2023. US region has seen a significant growth in the medical second option market with its ability to embrace the changing technology and use it for the betterment of lives. The US market collected revenue of $939million in 2017 and is estimated to grow at a CAGR of 17.1% throughout the forecast period. UK has dominated the global market in the European segment by recording revenue of $284.7million in 2017 and is projected to grow at a CAGR of 18.1% through the forecast period. The increased need for improved diagnosis and treatment planning, reducing the financial cost, and ease of interaction is expected to propel the market growth in the forecast period. Medical Second Opinion Service is the additional consultation taken by the patient after the primary diagnosis. The patient can opt for a medical second opinion if the patient feels dissatisfied with the diagnosis or if there is a need for further validation in case of some serious surgical procedures. There has been an upward flow in medical second opinion services mainly due to health, financial and legal costs involved in the treatment. The medical second opinion market is classified on the basis of disorders. The demand for a medical second opinion is high in chronic ailments such as Ocular disorders, Neurological disorders, pulmonary disorders and Nephrological disorders. Lately, many people all over the world take second opinion for Chronic Obstructive Pulmonary disease (COPD). COPD is an obstructive and chronic inflammatory lung disease which causes obstruction for airflow from the lungs. The main cause of COPD is due to tobacco smoking. COPD is often occurred in people exposed to fumes from burning fuel and heating in poorly ventilated homes. The pulmonary disorders market has recorded revenue of $81.50million in 2017 and is estimated to grow at a CAGR of 18.9% till 2023. The exposure of Asbestos fibers might cause lung cancer due to the silicate fibers that can persist for lifetime in lung tissue. The workplace is a common source of exposure to asbestos fibers, since these fibers are used in both thermal and acoustic insulation materials. Due to this, the use of asbestos has been banned in many of the countries including the USA. The Cancer segment in the global medical second opinion market recorded revenue of $554.46million in 2017 and is estimated to grow at a CAGR of 18.7% throughout the forecast period 2018-2023. Diabetes disorder has a major effect on medical second opinion market since patients diagnosed with diabetes tend to consider second opinion when they are uncertain with the diagnosis or unsure about treatment plan or the treatment plan suggested by the physicians has not resulted in any major changes. The diabetes segment recorded revenue of $324.92million in the year 2017 and is projected to grow rapidly at a CAGR of 16.8% till 2023.
Who are the Major Players in Medical Second Opinion market? The companies referred to in the market research report includes Johns Hopkins USA, WorldCare International Inc., Cynergy Care, Mediguide America, Medical Second Opinion Pvt. Ltd., UC San Diego Health System and more than 25 companies. 10.5. Medical Second Opinion Pvt. Ltd.